A book cover is 80% of a book sale, especially online. Which means that visually the cover needs to make sense. Your book cover is like bait. When you’re fishing, the right bait matters, because fish are smart. A trout won’t touch the wrong lure even in murky water. Trout look for a specific type of thing to eat and can detect a fake. A consumer audience is the same way. Writing a book isn't easy. If it were, everyone would do it. But we make it smooth, painless and fun! 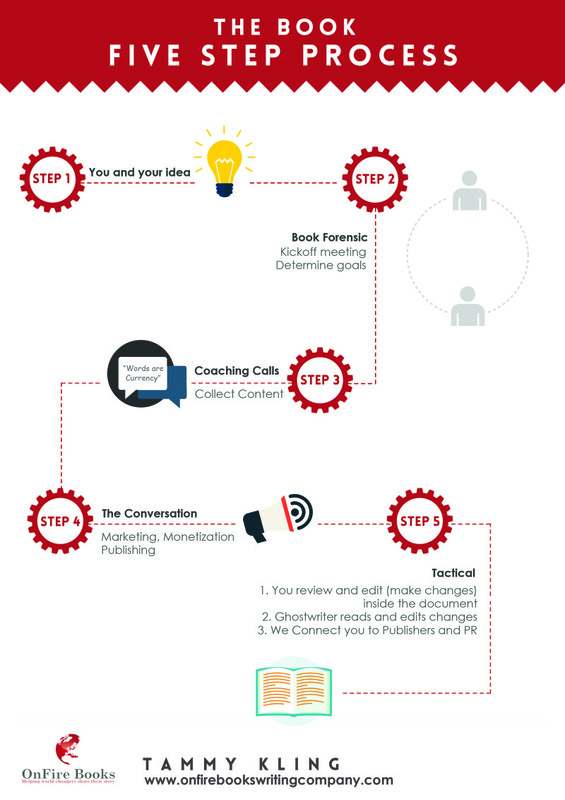 There are 5 steps in the OnFire Team book process. We lead you through them from start to finish. For over a decade we’ve worked with top Speakers, authors, and celebrities from all over the world. We focus on excellence – in creating your legacy, and monetizing it. Most speakers are not aware of how they can maximize results, sell books, and land speaking engagements. Many of our clients earn $3.5+ million a year just as speakers and authors. Most travel the world when they want, spend time with their families, and are intentional about their days. OnFire Books helps guide you through a 6 step process. This is a detailed business strategy coaching call. On this call we listen, a lot. The book introduction! A selling tool! Do you need a TED talk? How can we sell cases versus individual books! Book Publication Date, and date for your copies to be delivered. By the end of this program you’ll know everything you need to know to continually build your successful brand.